This is the Desert Island piece I did over at FPI, thought it would be fun to post it here. As you can imagine, it's VERY difficult to limit yourself to 8 comics. It seems to be an unwritten rule that one of three books must be included in any essential comics list- Maus, The Dark Knight Returns and Watchmen. 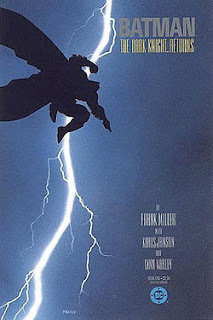 I was 12 years old when I first read The Dark Knight Returns and although I could tell there were deeper ideologies at work, I loved it for it's sheer bad-assery- Bats fighting the Mutant leader, Bats leading the charge on horseback, Bats knocking Superman for six: it was all there. It's hard to explain how different it was to the other comics I'd read up til that point, but if I told you I'd only read The Beano, Tintin, Aterix and the odd Batman title before it, you may get an idea. In a way, I consider myself lucky to have discovered it when I did- it both cemented my interest in comics and convinced me of the potential of the medium. 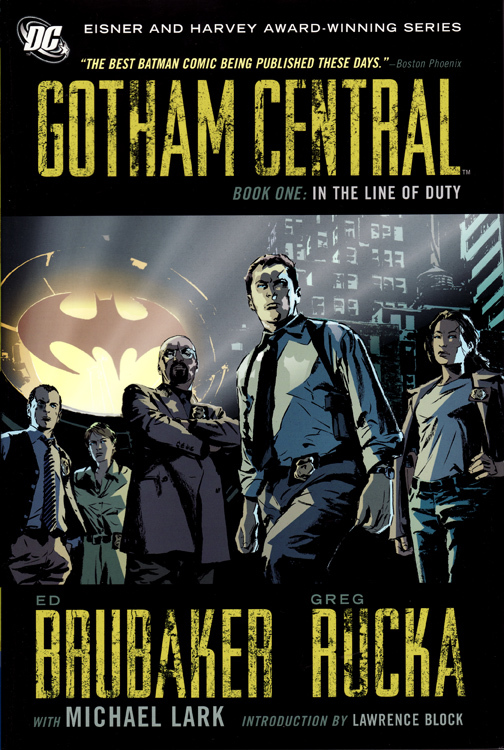 Gotham Central- one of those staring-you-in-the-face obvious brilliant ideas: a series exploring the difficulties the police force face working in the city of the Bat, written by the prodigious Ed Brubaker and Greg Rucka. How do you police a city in which a vigilante operates? His existence is a paradoxical statement on their function and ability to do their jobs- he's helpful (in a manner of speaking), but would he be needed if they were doing their jobs properly, and if he can do things they can't, to what extent are they complicit in his actions. 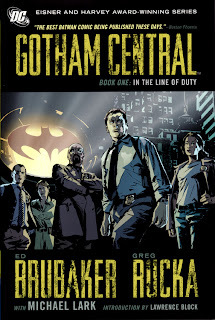 These issues, along with the minutiae of day-to-day policing and character's lives and the relationship dynamics within the police-room, are all what made Gotham Central a one of the best books I've read. It's a testament to the writing that you didn't spend the time reading waiting for the Bat to drop in, but that when he did, you felt the sense of awe, intrusion and defensiveness of the officers. 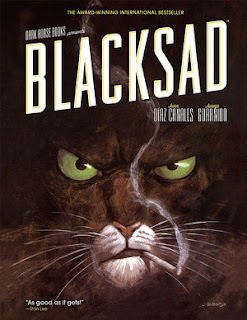 The English translation of Blacksad came out in 2000 at a time when I was beginning to explore comics beyond superhero titles (and by superhero, I mean Batman). Most of my prose reading consists of lone-wolf, maverick type troubled sleuths and I picked this up at the library because NOIR. CRIME. DETECTIVES. And a nattily trench-coated cat smoking on the cover. Until this point, I hadn't really noticed the art in any of the comics I read- some styles I preferred to others, but they were largely just pictures; nothing stood out as either spectacular or disastrous. There is no ignoring Juanjo Guardino's art, however- his detailed watercolours give the anthropomorphic characters an expressive, vivid life. Luckily I have the Dark Horse hardcover which collects the first 3 volumes so I would probably take that. Ian Edginton is one of my favourite writers-he doesn't get as much praise as he's worth and he doesn't write as much as I need him to. . Kingdom of the Wicked is a story about successful children's writer Christopher Grahame, who begins to have blackouts where he finds himself transported to the make-believe land of his childhood. Yet it isn't the utopia he knew, but a war-ravaged, fearful place, where the toys and characters he dreamt up have become soldiers and casualties of war. Initially dismissing the blackouts as strangely disturbing dreams, Christopher is forced to attempt to track down the mysterious dictator intent upon razing the land, when he realises he can't wake up. It boasts a great, weird twist at the end. If I could have an Ian Edginton anthology comprising of this, Leviathan and Stickleback, I would take it in a heartbeat. 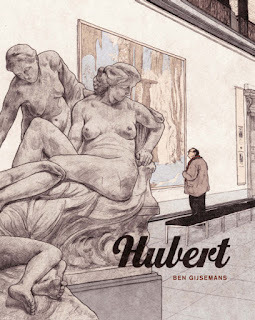 You often read of people's reactions to books- how they were left crying afterwards or thinking about if for days and the cynic in me is always a little sceptical, but this book left me with a feeling I can always describe as awe. 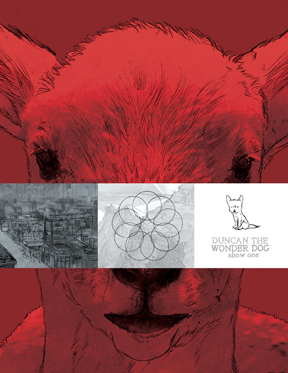 Superficially it explores a world where animals can talk and are treated like second class citizens, some who respond by forming militant groups in order to fight for their freedom and rights. I can't claim to fully understand it, but it's the sort of book you would want with you if you were stranded on a desert island- beautiful and dense, benefiting from multiple readings. 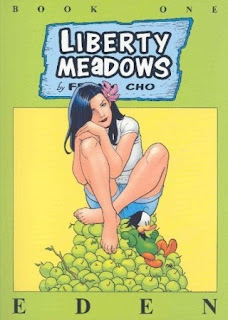 For light relief, I would take Frank Cho's strips about a hapless vet who gets a job at an animal sanctuary, which turns out to be a full-on rehab centre complete with a chain smoking pig with an alcohol addiction, a hypochondriac frog, a psychotic cow and a raccoon with OCD. Frank (the vet) is prevented from leaving this psychosis-inducing environment having fallen in instant silent, inarticulate love with the centre's generously bossomed resident psychiatrist, Brandy. Add to the mix the ongoing epic battle between sanctuary owner Julius with the mammoth catfish Khan and Cho's willingness to riff crazily off tangent and it makes for some hilarious comic reading. More noir, but in manga form. Tatsumi wrote this in 1956 when he was 21 but the art is till crisp and vibrant. It's a fairly straightforward tale of two crooks being moved between prisons on a train during a blizzard. A crash provides them with the opportunity to escape, yet handcuffed to each other, they must navigate the snow storm and each other. Chancing upon a cabin in the woods, they enter it to hide from the police and within, a more complex narrative enfolds. It's a surprisingly melancholy, bitter-sweet story with values of love, honour and family at its heart. 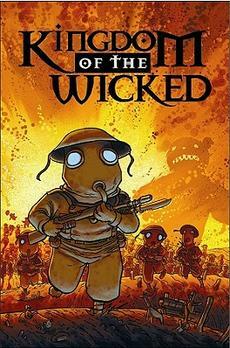 Finally, a comic series that probably defined a lot of people's childhoods, including mine. Despite the occasional murmurings about Tintin in the Congo, there's something evergreen about Herge's creation. It has that key element that every child longs for: adventure. 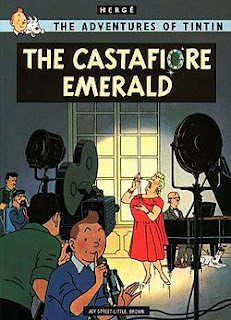 Putting the 'investagtive' into investigative reporter, Tintin is deceptively resourceful for one so innocent looking. Often aided (-ish) by Captain Haddock and Snowy (both who are fond of a tipple), Professer Calculus and the Thompson twins, Tintin also has the benefit of a great supporting cast. My favourite Tintin story is probably The Castafiore Emerald, but Egmont Books do those fantastic 3-in-1 digest sized hardbacks which I'm collecting, so I'd have to take them.